Milwaukee Tool Ice Hardened™ Hole Dozer™ General-purpose hole saw kit includes 3/4-Inch, 7/8-Inch, 1-Inch, 1-1/8-Inch, 1-3/8-Inch, 1-1/2-Inch, 1-3/4-Inch, 2-Inch, 2-1/8-Inch, 2-1/4-Inch and 2-1/2-Inch hole saw. It also contains two 49-56-7010 and 49-56-9100 arbors, two 49-56-8010 pilot bits, 49-56-6560 adapter and a 49-67-0120 spacer. 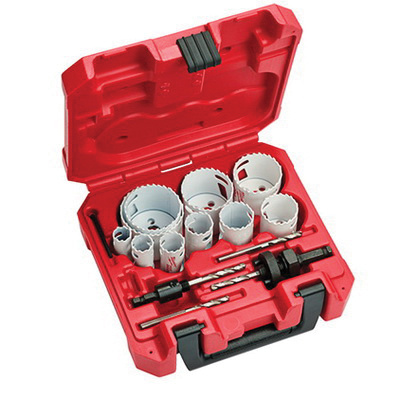 The bi-metal hole saw is perfect for cutting precise round holes in a wide range of materials.